Penneys. Of course! They offer some very colorful, useful athletic styles that are surprisingly robust. Some of my favorite pieces are from Penneys and have held up wash, after wash, after…. I wouldn’t bother with their yoga mats — they are very slippery and thin. You would be better off looking elsewhere — even Amazon.co.uk. Tesco. These may sound quite obvious, but even in places we go to often, we rarely take the time to browse the clothing sections. I didn’t even realize Tesco had athletic clothes for ages! Like Penneys, they have some nice colorful pieces, as well as decent sports bras (for the ladies!). They even stock a nice yoga mat which some students have brought to my attention! Dunnes. Dunnes has a fairly large selection of athletic clothing. They offer more basic colors than some of the other shops, along with colorful and printed tops and bottoms. They also have a basic athletic mat, though I cannot vouch for the quality! New Look. I really like the pieces here. There are basic colors, bright colors and prints, like most of the other shops, but the details in the pieces make them a little more unique — a zipper here, a cuff there. It is definitely worth a Look! Marks & Spencer. M&S is probably the most expensive on this list, however, they cannot be beat for their sports bras. They are great quality and incredibly supportive. The clothing is also very good quality, thought the colors and prints are more subdued in their clothing compared to the other shops I’ve listed. 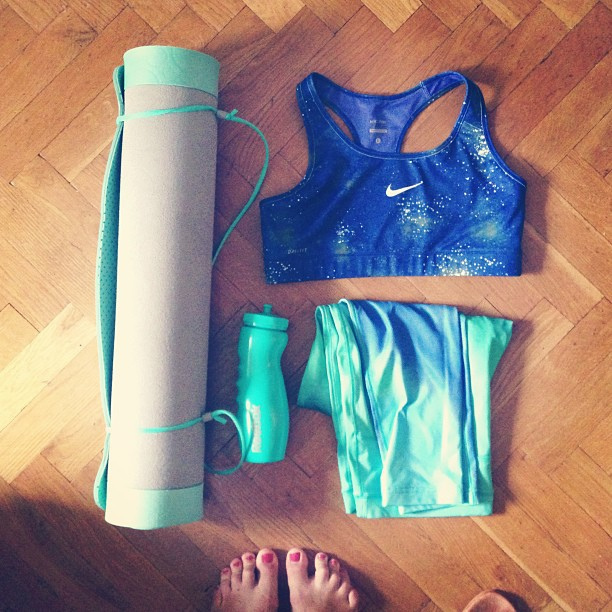 If you are looking for less flashy yoga wear, have a look here. Honorable Mention goes to TKMaxx. I know they are not in Killarney (yet… I’ve heard a rumor that they may be setting up shop here soon), but it is worth a trip to browse through the seemingly endless styles. They usually have a pretty good collection of sporting accessories too — mats, blocks, straps, etc.